GROBY, LEICESTER—November 15, 2011—The PACE 1000 pressure indicator is the latest in the new generation of PACE high precision, modular pressure instrumentation for rack-mounting, test bench or bench top applications from the Sensing business of GE Measurement & Control Solutions (NYSE: GE). It is available in three grades of precision performance and a choice of pressure ranges, pneumatic and hydraulic, and features internal data logging as standard. It will find application throughout the industrial, process and metrology sectors and an aeronautical option provides all pressure indications in aeronautical units. 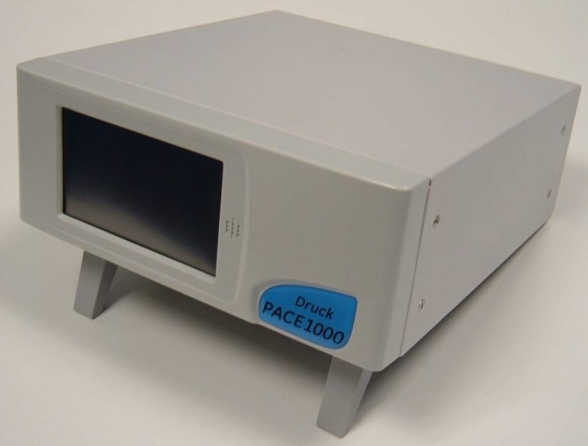 The inherent precision and stability of the PACE 1000 is derived from the instrument’s incorporation of GE’s range of digitally-characterized, piezo-resistive and resonant pressure sensors. This has allowed three grades of accuracy, up to 0.005 percent of full-scale deflection, to be offered to suit specific requirements, while long term stability is up to 0.01 percent of reading over a year. The instrument’s internal logging feature simplifies tasks such as sensor—and leak-testing and data is available through an on-screen display or can be downloaded to a PC. Pressure ranges are available up to 1000 bar (14500 psi) gauge and absolute and up to three individual channels can be displayed on the instrument’s high resolution touch screen. A touch screen and a high-resolution ¼ VGA display ensure that the PACE 1000 is extremely easy to operate and read. A simple icon menu allows easy and intuitive set-up of controller parameters and connectivity via RS232, IEEE, Ethernet and USB providing for easy PC and peripherals connection, as well as the use of set-up software and diagnostics downloads for technical support. A wide range of options includes a leak test facility, a switch test capability for automating the testing of pressure switch devices, volt-free contacts for control of peripheral devices such as vacuum pumps and ovens and analog output to allow the instrument to interface with PC or PLC I/O cards, remote displays or other data logging equipment. Measurement & Control Solutions is a leading innovator in advanced, sensor-based measurement, non-destructive testing and inspection and condition monitoring, delivering accuracy, productivity and safety to a wide range of industries, including oil and gas, power generation, aerospace, transportation and healthcare. It has more than 40 facilities in 25 countries and is part of GE Oil & Gas.